So you’re ready to create some t-shirts or apparel, but you’re confused about the differences between decorating methods, making you not sure which method you should go with? No worries, I’ve got you covered with a quick run-down on the pros and cons of each. EMBROIDERY: Is a craft that involves stitching pictures, scenes, or decorative accents on cloth or other materials using a needle and either thread or yarn. It can be done by machine or by hand, and it can be simple in design or extremely intricate. DIRECT TO GARMENT v SCREEN PRINTING: Has been one of the biggest questions and debates in the garment decorating industry today. Screen printing has been around forever and was first patented in 1907 in England by Samuel Simon Matthew Atere-Roberts. Direct to garment printing is fairly new to the garment decorating world and has been around since the mid-1990’s. Each has its pros and cons just as anything else. It's not as simple as one being "better" than the other, it's a question of which one better suits your needs! Below we are going to break this down and let you decide which method, Embroidery, Digital Printing, Screen Printing or Sublimation Printing is more beneficial for your project! ​MOD 1 & FLEXI-JET DIRECT TO GARMENT DIGITAL PRINTERS: Our Direct to Garment (DTG) Digital Printers are the latest technology in full color photo quality printing. Advanced technology gives us the ability to print on both white and colored garments, as well as 100% polyester, making it possible for us to offer our customers a solution to printing smaller orders (1 piece) with an almost unlimited number of colors in the design. For many customers, this is a great way to get full color prints on just a few shirts. How does it work? If you think about your paper printer at home, a digital printer is the same idea, as the garment passes under the printer it is printed on much like the paper in your home printer, but the inks are formulated for garments. Now allowing your photo or creative ideas to be printed on a t-shirt and give it to grandma. Customized apparel has never been easier. 12 COLOR AUTOMATIC SCREEN PRINTING MACHINE: With our state of the art Automatic & Manual Screen Printing Machines, we can print up to 12 colors (minimum orders apply). From Simple one color work to more complex four color process designs, we will give you the quality prints you can be proud of. With both manual and automatic presses, we are able to handle orders as small as 12 pieces and as large as 120,000 pieces on high quality products, with great prices, and unmatched service to customers large and small. 145 HEAD EMBROIDERY MACHINE: Embroidery gives a certain look that printing is unable to achieve. The amount of colors, like DTG Printing, is not a factor like in Screen Printing, making Embroidery great for very colorful designs on smaller quantities. Also areas of individual personalization prove to be a more economical solution than printing due to the set up costs. Unlike printing, cost is based on the size of the logo, more specifically the stitch count. Certain garments require or look better with embroidery. SUBLIMATION PRINTING: A dye-sublimation printer, is a computer printer which employs a printing process that uses heat to transfer dye onto materials such as a plastic, card, paper, or fabric. Sublimation is a transfer process in which the image becomes a part of the actual item. Sublimation needs special ink, paper and specific substrates with polyester coating to work. When heated to high temperatures, sublimation ink turns into a gas. Pores of the polyester coated item open up and allow the gas to enter. Then, once removed from the heat, the pores of the polyester substrate close up, trapping the ink inside. The entire image will be smooth to the touch. DUAL AIR FUSION HEAT PRESS: A heat press is a machine engineered to imprint a design or graphic on a substrate, such as a t-shirt, with the application of heat and pressure for a preset period of time. While heat presses are often used to apply designs to fabrics, they can also be used to imprint designs on mugs, plates, jigsaw puzzles, and other products. 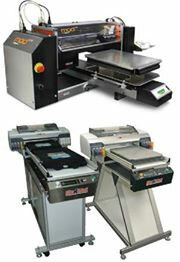 A heat press can be used for Direct to Garment and Sublimation Printing to cure the ink to the garment. EDGE GARMENT PRETREATER: Pretreament is a liquid solution used by Direct-to-Garment printers to allow the printing and washability of white ink, or full color images on a variety of colored shirts, most commonly black shirts. The concept is simple... Just as drywall is primed with primer before painting, this primer allows the colored paint stay on top of the drywall and not soak in. If the paint soaks into the drywall, the color selected will be muted and off color.